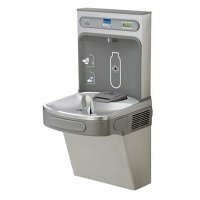 In its continual sustainability initiative, CCG Marketing Solutions (CCG) recently installed Elkay EZH2O water bottle refilling stations in its West Caldwell, New Jersey headquarter facility. The filtered water system ensures CCG’s employees are enjoying the cleanest, purest water available as well as eliminating plastic bottle waste, reducing costs, and enhancing employee and guest health. The Elkay system provides a counter the tallies how many plastic water bottles have been avoided. That number has become an important part of CCG’s overall sustainability initiative. According to the counters on the water bottle stations, CCG has eliminated nearly 80,000 water bottles. Simon hooks (CCG, CEO) commented, “This is part of CCG’s overall commitment to reduce, reuse, recycle. Water bottles, and plastic of all kinds has had a devastating impact on the global environment, on all animal, and on human life throughout the world”. It is estimated that 12.7 million tons of plastic waste makes its way into the oceans every year with devastating consequences for animals and marine life. Our landfills, rivers, and estuaries have also become heavily polluted. CCG is also reviewing its Corporate Guidance and Governance Policies to ensure that they are consistent with CCG’s sustainability initiative. CCG is also working closely with all its suppliers and partners to ensure that they too are taking steps to dramatically reduce the impact on the environment. CCG Marketing Solutions is a technology driven marketing services provider and is regarded as an industry leader in data intensive fulfillment and marketing programs. CCG provides powerful solutions and experienced subject matter experts focused on reducing operational costs, streamlining and automating key business processes through the application of technology and best practices benchmarking, increasing speed to market, and improving ROI.